How long does this sorting program run? It possibly takes a very long time on large inputs (that is many strings) until the program has completed its work and gives a sign of life again. Sometimes it makes sense to be able to estimate the running time before starting a program. Nobody wants to wait for a sorted phone book for years! Obviously, the running time depends on the number n of the strings to be sorted. Can we find a formula for the running time which depends on n? Having a close look at the program we notice that it consists of two nested for-loops. In both loops the variables run from 0 to n, but the inner variable starts right from where the outer one just stands. An if with a comparison and some assignments not necessarily executed reside inside the two loops. A good measure for the running time is the number of executed comparisons. In the first iteration n comparisons take place, in the second n-1, then n-2, then n-3 etc. So 1+2+...+n comparisons are performed altogether. According to the well known Gaussian sum formula these are exactly 1/2·(n-1)·n comparisons. Figure 2.8 illustrates this. The screened area corresponds to the number of comparisons executed. It apparently corresponds approx. to half of the area of a square with a side length of n. So it amounts to approx. 1/2·n2. How does this expression have to be judged? Is this good or bad? If we double the number of strings to be sorted, the computing time quadruples! If we increase it ten-fold, it takes even 100 = 102 times longer until the program will have terminated! All this is caused by the expression n2. 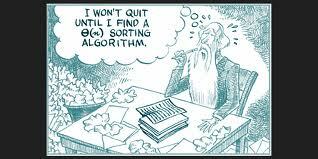 One says: Sorting by minimum search has quadratic complexity. This gives us a forefeeling that this method is unsuitable for large amounts of data because it simply takes far too much time. So it would be a fallacy here to say: “For a lot of money, we'll simply buy a machine which is twice as fast, then we can sort twice as many strings (in the same time).” Theoretical running time considerations offer protection against such fallacies. 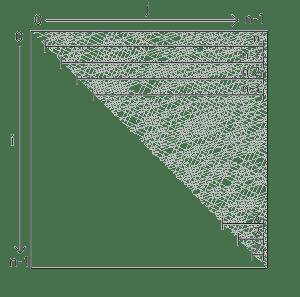 The number of (machine) instructions which a program executes during its running time is called its time complexity in computer science. This number depends primarily on the size of the program's input, that is approximately on the number of the strings to be sorted (and their length) and the algorithm used. So approximately, the time complexity of the program “sort an array of n strings by minimum search” is described by the expression c·n2. c is a constant which depends on the programming language used, on the quality of the compiler or interpreter, on the CPU, on the size of the main memory and the access time to it, on the knowledge of the programmer, and last but not least on the algorithm itself, which may require simple but also time consuming machine instructions. (For the sake of simplicity we have drawn the factor 1/2 into c here.) So while one can make c smaller by improvement of external circumstances (and thereby often investing a lot of money), the term n2, however, always remains unchanged.